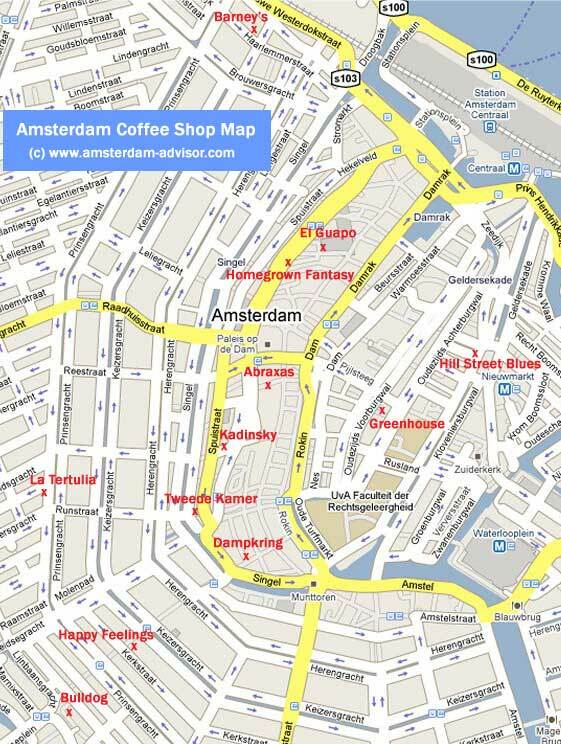 Here's an Amsterdam coffee shop map showing only the places that made it to our page of Amsterdam coffee shop reviews. Of all +200 coffee shops in Amsterdam, our Amsterdam coffee shop guide and the map below only list those coffee shops with consistently good user reviews who are located within the city centre and the Western canal belt (where all the other action is too). We are working on a complete Amsterdam coffee shop directory, but this may take some time. Take this Amsterdam coffee shop map with you, because coffee shops (some mistakenly call them Amsterdam cannabis cafes or coffee houses) aren't allowed to advertise. Their websites will often not say anything about the Amsterdam weed they are selling, simply because they don't want to be suspected of advertising and lose their license. Some are recognizable by the cannabis leaves on their windows (see picture), but others look like regular pubs or even diners from the outside.